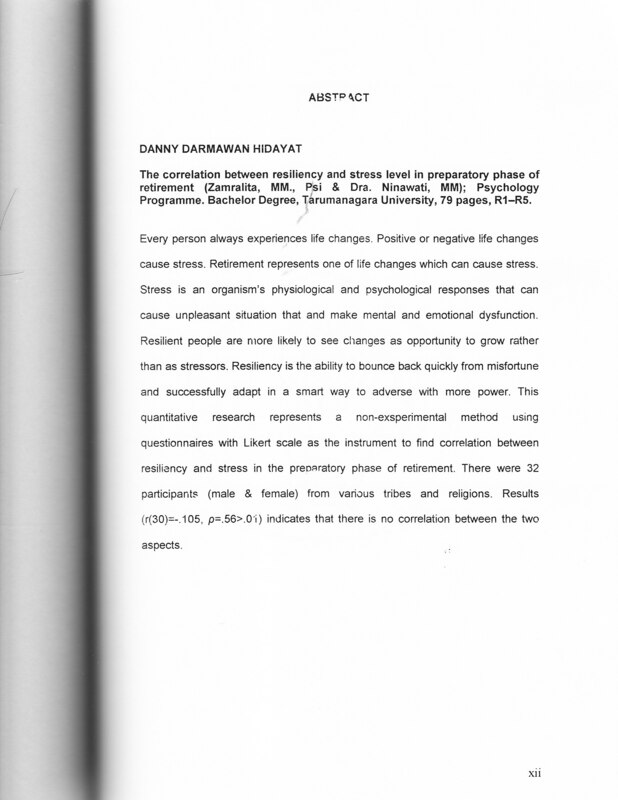 Darmawan, Danny (2005) Hubungan antara resiliensi dan tingkat stress pada masa persiapan pensiun. Skripsi thesis, universitas Tarumanagara. Every person always experiences life changes. Positive or negative life changes cause stress. Retirement represents one of life changes which can cause stress. Stress is an organism's physiological and psychological responses that can cause unpleasant situation that and make mental and emotional dysfunction. Resilient people are more likely to see changes as opportunity to grow rather than as stressors. Resiliency is the ability to bounce back quickly from misfortune and successfully adapt in a smart way to adverse with more power. This quantitative research represents a non-exsperimental method using questionnaires with Likert scale as the instrument to find correlation between resiliency and stress in the preparatory phase of retirement. There were 32 participants (male & female) from various tribes and religions. Results (r(30)=-.105, p=.56>.0'i) indicates that there is no correlation between the two aspects.